These Attention-Grabbing Table Skirts are Among the Most Popular Covers Available! Select the Color, Size, and Style of these Tablecloths to Create Alluring Presentations! This is Where to Buy Table Skirts on the Cheap! Pleated skirts included for deluxe style. Clips included for attaching skirting to tables. 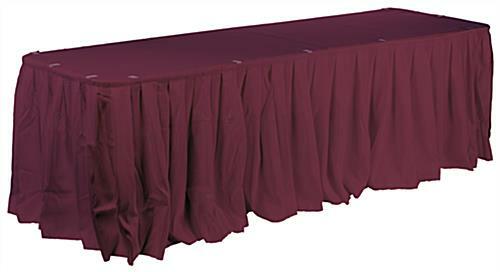 Table linen sized 54" x 96" for 6' long tables. These linens, table skirts include everything needed to develop a banquet or trade show table into a looker. Skirting is included to provide a cover for legs or other stored items. Box pleats give the table skirts upscale and sophisticated style. They measure 54" x 96" and are designed to fit over 6' tables. The table skirts fit all the way around 6' long tables. Our company encloses each set with (10) clips to easily attach all the topper and skirting. Both the table skirts and runners are manufactured from 100% polyester. Polyester fabrication is more durable than some other materials used to make covers. Table skirts are also machine-washable and wrinkle-resistant. These features enable the linens and throws to be used time and time again at locations, like banquet halls, convention centers, and other large-scale venues.